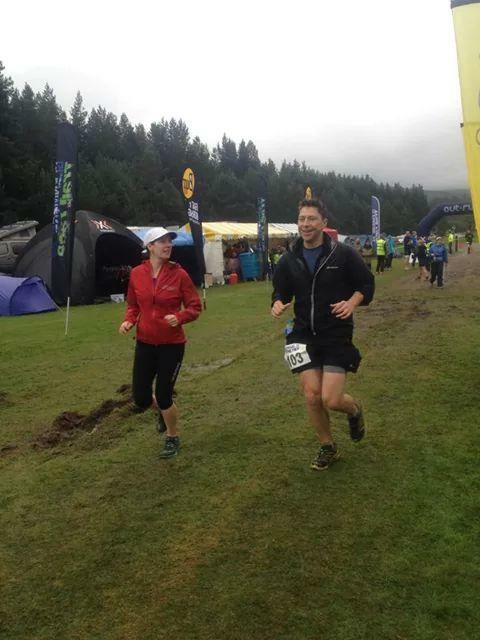 Glenmore 24 – the craziest, funnest, scariest, most challenging thing I have done. Had a fab time meeting up with friends, Harmenies and Fetchies (friends from fetcheveryone.com) before, during and after the race. Amazing organisation and support from Bill and Mike Racing Events, all their helpers, marshals, volunteers and from all the other participants and crews. Very lucky to have great support from Keziah who decided to be my crew for the weekend, without my asking – took me up on Saturday morning, fed me and shouted at me through the day and some of the night, ran last 16 miles with me and kicked my b*tt to keep me going. Star. 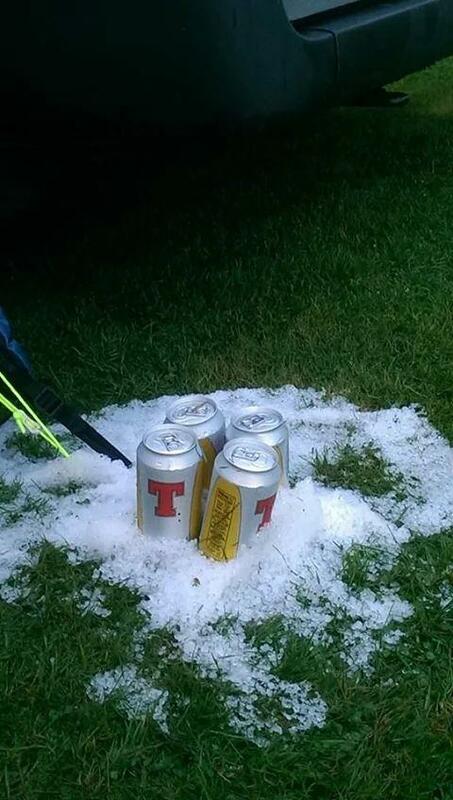 Hailstones left somewhere for beers to cool, at least! Harder at the “start” – first 6 hours I hoped for 36 miles, to be averaging 10 min/ mile including stops. Only managed 32 miles at 11 min/ mile. Think I had 2 or possibly 3 big (sorry!) loo stops (thank goodness for loops/laps and portaloos). Just the horrid food etc? Ate pasta, cakes, fruity bars. Midnight – 6am, didn’t slow down much more 15 min / mile. Garmin died at 16 hours about 1 mile into 4 mile lap, so it lost 3 miles, but just averaging those out, I think the average pace is right. Didn’t enjoy “sleep deprivation”. Felt like I was sleep running. Glucose and caffeine tablets helped. Was sick of sweet food. Was made fresh filter coffee by another lovely support crew (Keziah went to bed about 1am!). Coke was good. Totally forgot I had Red Bull with me, brought it home again. Tried a caffeine gel, the ones I have used for 5 years in marathons. Closest to boak that I got on the day/night. Chucked it after trying to get half down! Very happy to get the hooter at 100 miles. My super impromptu support runner, Keziah. Then the final hooter. 24 hours. All done. And I was done. Completely! I got shoes off. Feet lacerated (hadn’t changed shoes or socks, despite the very wet conditions – we had torrential rain and even heavy hail stones). Walked to car. Keziah gave me dry stuff to change into. Fell asleep in front seat of car. 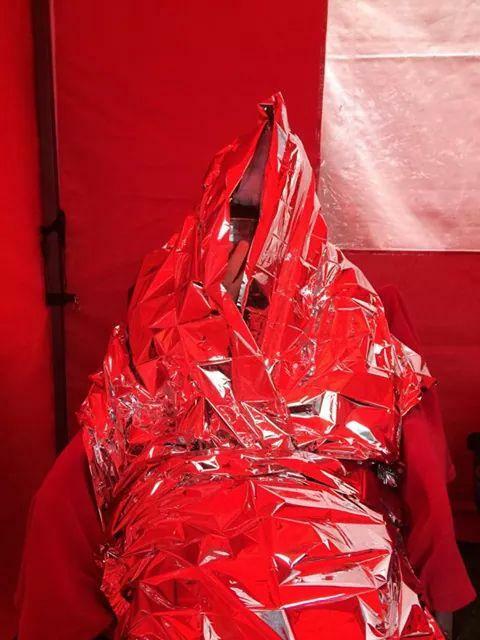 Tried to get out for prize giving, but couldn’t stand, so was put in chair in medical tent. I was fine, just tired and sore. Woose! I’m under that foil blanket – and I’m not giving the finger, I’m holding a plastic cup of Irn Bru, which I didn’t want! Err… see part 2 for food, approach, kit, support etc. later. Thanks so much to all the wonderful marshals, organisers, volunteers and supporters. Great experience. And all the clubmates for help, advice and support too of course. Ready for WHW in June 2015 now! Was a bit stressed about packing and travel. Then I was getting a lift and wasn’t sure if that was better or worse! I had booked hotel for the Sun night (night after the race) but didn’t have a tent for the night of the race. Tent would only be required if I couldn’t run, so I was ignoring it! As it turned out a gazebo, to keep the kit dry, would have been useful! Packed into 2 x 32L under bed storage box things (£4 from Tesco – google ’em!) for dry stuff, 1 x collapsible basket for food/packets, flasks and containers. Collapsible table to put it on (wallpapering one! Proper camping one would be better). Didn’t bring chair as Keziah had two (didn’t need it in the end – go me!) Umbrella was useful to put over stuff, proper gazebo would have been better. Clothes: packed 2 t-shirt, 1 vest, 1 long, spare hat and gloves, 3 spare pairs trainers, spare socks, undies, buffs, shorts, longs, waterproof trousers (no spare jacket – I don’t have another one). Put out to wear: t-shirt, micro fleece, jacket, u nder shorts, shorts, socks and shoes. Hat and gloves and buff in bum bag. What, you want to know brands? Hoka Rapa Nui 2 shoes, Thorlos socks, Adidas undies, Brooks shorts trail (pockets), no brand t-shirt and fleece, Montane H2O jacket (no longer properly waterproof!) Odlo hat and gloves. Spares included old Hoka Rapa Nuis, old Inov-8 Flites (in case comfy required), Inov-8 X-talons (in case grip required), Gore longs, club vest etc. Kit: packed 4 head torches (!! ), ultra vest and bottles, foil blankets, power banks, charger, pins, painkillers (cocodamol 8mg codeine, 500mg paracetemol), caffeine tablets (Tesco’s own – like ProPlus but with glucose too), Succeed s-cap electrolyte tablets, sun cream, midge repellant, midge net, micropore, plasters, sunglasses, sun visor, bite cream, savlon, vaseline (x3!). Foil blanket, whistle, compass, phone in bum bag, headphones, GPS on wrist. Brands? Garmin 310xt GPS, Alpkit and Petzl headtorches, Ultimate Direction PB vest and bottles, Inov-8 Race Pro 4 bum bag (bladder removed). Food/drink: Flask coffee, food flask shepherd’s pie, pasta salad, 4 yoghurts, grapes, apples, bananas, crackers, cakes, fruit bar soft, choc bars, gels, mints, 8 bottles water, 4 Lucozade, 4 Red Bull, 4 iced coffee drinks, 2 Cokes, 4 banana milkshakes. Carried polos, apple, 2 bars and water. And bottle of fizz for 100 mile point. 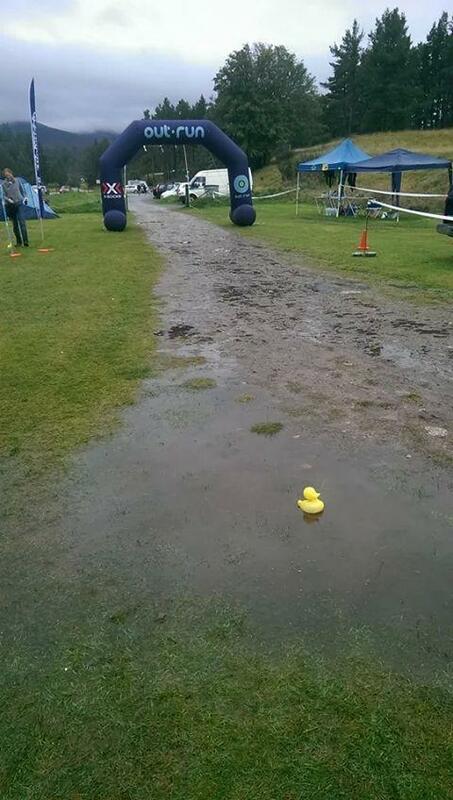 Other: change of clothes, towel, toiletries, wallet, swim gear, undies, dry trainers (comfy shoes – Inov8s Joopsy, for everything! ), shirt, t-shirt, jeans, hoody, sleeping bag. Clothes: didn’t change a thing! What I wore up on the drive and at the start, I finished in. I discarded bum bag after 1 lap (mrs shanksi’s recommendation – thanks hun!). The spares were necessary to have there as backup, but I never needed a thing. Kit: Alpkit headtorch, second set of batteries (from the Petzl – was just easier to store them in another head torch! ), powerbank and charge clip for Garmin (see previous blog for how that worked). Didn’t consume/change anything other kit, I don’t think. Oh, Vaseline. Lots, used more than 1 tub, reapplied after each loo stop! Food/drink: Ate the hot food and drink, the pasta salad, lots of cake and fruit bars, one or two Lucozade, half a gel, one iced coffee drink, 2 Cokes, 2 banana milkshakes, some brownies, some grapes, 2 apples, a banana, 2 packs polos/mints, took 10 cocodamol, 8 caffeine and glucose tabs, 20 Succeed S-caps. Also had For Goodness Shake and extra coffee provided by Keziah as I was looking grey at end. Forgot my own Red Bull, foam bananas and various other snacks. Clothes: all great, as I didn’t change! Pockets are particularly useful! By 16 hours feet were mashed, but seemed no point changing. It was so wet, wouldn’t have helped. I emptied 1 sock / shoe out of water, sand etc. But to be honest, wasn’t any better after. Think I just wanted excuse to stop! Layers (fleece and jacket, gloves and hat) are great cos you can go down to quite cool and zip up to quite warm, without stopping. I was actually cold through early on during heavy showers but was warmer after some sun, then fine overnight even though going more slowly. Don’t know why. No chafing, except bum by end after I’d forgotten to re-Vaseline after a final loo stop. Only 4 hours of discomfort – didn’t care by then! Rapa Nui 2s were great – loads of protection. Kicked a tree root twice and didn’t damage toes. Enough grip even on wet grass loops at end. Kit: Fine – Garmin died at 15:45 hrs (see previous blog) surprised that it didn’t warn me earlier. Maybe it did and I didn’t notice? Headtorch (Alpkit, £15!) fine. Batteries flickered but survived the rest of lap, replaced easily enough. *Update: forgot about music/headphones – these weren’t used at all. I thought I might need something to keep me going, but to be honest, chatting to people and with only 2 miles between start/finish and the half way checkpoint, there really wasn’t much chance for music or stories. And sometimes I just sang instead! Cocodamol was awesome. Started 9, then 12, 3, 6 and 9 roughly. A bit too many, but I’m bigger than a small person, so it certainly wasn’t overdose risk. I never felt “high” or buzzy, it was just enough to numb the pain. Caffeine tabs seemed to perk me up. Got no cramp, so Succeeds will be used again. No idea if it was them or the food, or just the gentler terrain, but no cramp was a blessing! Food/drink: Well, most of it was ok, but Keziah will tell you I didn’t eat enough. I couldn’t eat much more than I did, I felt like I was full the whole time. My tiredness and low energy says otherwise, but how to get more calories in? I was taking on the highest cal stuff you can imagine, and real food. Anyway, more to do here, but mostly ok. I really liked: apples, grapes, crackers, cakes (at start). I was less keen on shepherd’s pie, sick of cakes by end, couldn’t take my gel at all. Banana milkshake was good. Iced coffee drink not so. Lucozade hard to take by the end. Mints – they were tops, freshens mouth, some calories in and keeps you drinking too. Kept my water and hydration going. Drank a lot! Other: there was no navigation in this race, so no need for map, navigation ability, route uploaded electronically or even for a compass. When sleep-running I did nearly miss one of the huge (A3 laminated luminous yellow sign with huge black arrow) turn left signs. One guy I spoke to did miss one and did an extra half mile. Not fun! Food/drink: 3 or 4 big loo stops in first 6 hours was a bit unpleasant. Maybe inevitable because of slow pace and lots of food intake? I don’t really want to go the Immodium route. Not enough food/calories? Was a def bonk early on, maybe 5 or 6 hours in. Try taking glucose tabs earlier? Food/drink: Fruity sweets maybe (I hoovered some Haribo at one of the checkpoints. Mind you, I had foam bananas and forgot to open them). Nuts, dried fruit? Try taking glucose tabs earlier? Wouldn’t bother with bum bag in v. short distance between checkpoints. Carry the minimum you can. Though WHW is longer between checkpoints, greater variation of altitude (gets cold and hot more quickly), so will need something. Maybe swap about? How you gonna drive your car to your hotel after you finish (or worse, put up or down a tent or even get yourself into a sleeping bag) if you can barely walk? You might think you are eating, but the person who sees you peck at a bit of salad with a fork, or come back with the same choc bar you left with knows you’re not eating. No one kicks your b*tt as good as good support, no matter how tough you think you are on yourself. So, once again, thank you, thank you, thank you, to my marvellous impromptu support Keziah . She kept me running for the last 4 laps, without which I wouldn’t have made the 26th lap for 104 miles and might not have made the 25 for the 100 miles. Other: change after was fine. Hotel fine. Remember a big coat, because you will be cold if you have to be outside. Had my swim gear but didn’t swim, too busy being sociable! Had plenty cash for shared meal / bar costs (saves a walk to a cash machine when you don’t want to be walking!) Bottle of fizz came home. No one fancied it at 100 miles at 10am on Sun morning after 22 hours out! Right, that’s all I can remember. I’ll add as things come back. Gotta keep a record, cos if I can’t remember everything now, what would I remember come June 2015?! Thanks for all your kind words and support. You rock! … gathering links to blogs about this year’s Glenmore 24 (24 hour trail race last weekend). There are some corkers. This entry was posted in Uncategorized on December 23, 2014 by happygrrr.